This entry was posted in GAPS diet, PCOS, SIBO and tagged GAPS diet, low-carb, low-FODMAPs diet, paleo, PCOS, polycystic ovarian syndrome, real foods, SCD diet by Aglaée Jacob, MS, RD [radicata nutrition]. Bookmark the permalink. Love the idea of the carrot muffins. How does one purée a carrot? Also, what temp and for how long? I first boil my carrot until cooked and then pure them in a food processor. I baked my muffins for about 25 minutes at about 350F, but do the toothpick test as the time could vary depending on your oven and the size of your muffins! 😉 And don’t forget to serve them with butter, ghee or coconut oil! I’m on an SCD/Paleo diet and have been for about a year. I wonder about my kidneys…. All the protein I eat I imagine is a lot for the kidneys to manage. I wonder if you have any thoughts about this? How has the SCD/Paleo diet been working for you so far? I would love to know more about your experience and the reasons why you started eating this way in the first place. I understand your concerns about the protein intake and kidney damages, but I really believe this is a myth. First, I do not believe that protein is harmful for healthy kidneys (although it could be another story if your kidney function is already impaired). And perhaps even more importantly, I do not believe the SCD/GAPS/Paleo diets are necessarily high in protein. I encourage you to log your food intake for 2-3 days on fitday.com if you want to be reassured. Everytime I do it, it turns out that I get between 15-25% of my calories from protein, which corresponds to 80-100 g of protein on most days. You can calculate the grams of protein you consume per kg of body weight, which in my case gives me 1.1-1.3 g/kg, well below the upper acceptable limit of 2 g/kg (which might actually not even be a real concern with healthy kidneys). Moreover, it appears that a very low-carb, moderate protein and high-fat diet like the hybrid of the GAPS/SCD and Paleo diet, which is usually ketogenic, could be in fact protective for your kidney function, as shown in a recent study done with mice [http://www.plosone.org/article/info:doi/10.1371/journal.pone.0018604]. More studies are needed, but I hope this alleviate your concerns. Tonight i had an eureka moment browsing pages about leaky gut and GAPS, that could actually explain why I’ve got GI symptoms. The doctors told me the tests were fine, that I probably had IBS and that I should try to reduce stress. Over the last year I have gradually been reducing stress, gluten, sugar, coffee, and taking probiotics, and it has helped a lot but the improvement has been painfully slow. Two weeks ago I tried a very low carb diet that included fat milk products, it did wonders and made me realise that there was a cure and that it probably lied in the diet. After a week on the low carb diet I went paleo, and here I am just starting a personal 30 day dietary challenge to see if a strict paleo diet can make my GI symptoms better. Seems like I get bloated from apples, so I won’t be eating fruit either. 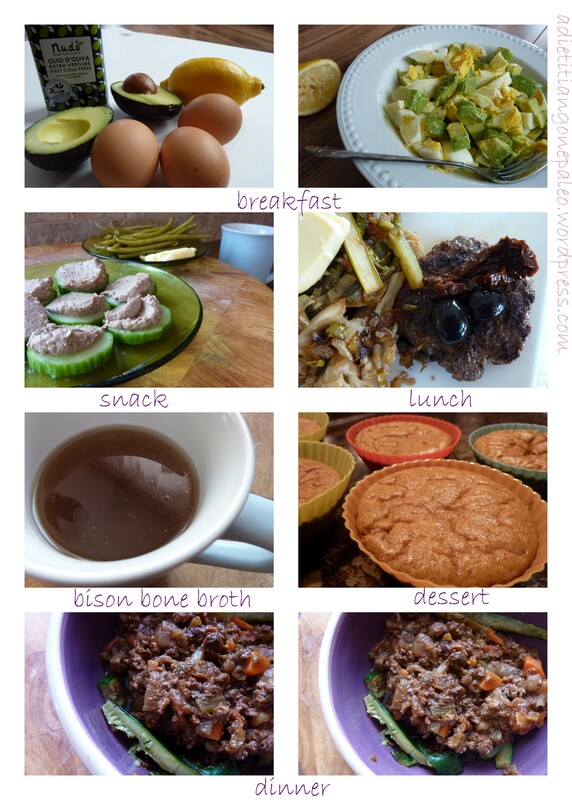 I’ll definitely be following your blog, the daily meals photos provide great inspiration and you seem to have a better grip of GI-symptoms treatment than my doctor! I am glad you are now on the good path to better GI health! 😉 Good luck! Have you got any experience of whether the introduction stage of the GAPS-diet is important to follow? According to Natasha it is recommended to do so, and maybe I could move through it quite rapidly as my symptoms aren’t that bad. Any thoughts on using supplements while on the introductionary stage, for example HCL, enzymes, glutamine, probiotics? I guess it would be best to stay of decaffeinated coffee as well? I think the stages are important to follow and depending on your symptoms, you may be able to move quicker. I am still not on the full GAPS diet, even after 5-6 months. I still need to avoid fruits, squashes, nuts and limit honey, but everybody is different. The best way to know is to start slow and introduce foods one at a time. Coffee, whether it is decaffeinated or not, can be irritating for your guts… I suggest avoiding it at least for the first few weeks. Try teas instead, if you like. Regarding supplements, it all depends on your symptoms. If you feel like you don’t digest food properly (feel like food is sitting in your stomach a long time or see undigested food in the toilet), digestive enzymes with betaine HCL could be a good idea. I have used L-glutamine to help restore my gut, but don’t think it made a big difference in my case, but you can give it a try. Probiotics are tricky because everybody reacts differently and there are so many different brands with different strains and amounts of live bacteria. Fermented foods is probably best (i.e. sauerkraut, homemade yogurt), but if not, you can certainly try probiotics. Just try to change one thing at a time and wait 3-4 days before trying something else so you have a clear picture of what is happening. I’m now officially on the GAPS intro-stage, very curious about what it’s going to do to me. I noticed from your meal logs that you often eat rather late in the morning, is that because of the detoxification taking place and do you think it makes a difference for you? About supplements i read that Natasha thinks you should just be taking the essential ones probiotics, fatty acids and vitamin a+d during the intro-stage. I think I’ll try that and wait with the others until a little later. Awesome! Keep me posted. Yes I used to not eat before 10am-noon, to help with the natural cleasing waves of the intestines during the morning. However, because of adrenal issues, I have now started to eat earlie (btw 8-9 am). If you are hungry, eat! You can experiment with both approach, but I think that what you eat is a lot more crucial that when you eat it. Hi! I am new to your site and came across it by searching FOODMAPS and SIBO. I have IBS and suspecting SIBO but not sure. I follow a paleo diet but started FOODMAPS in order to address (hopefully) my bloating. I suspecedt it might be the brassicaceae veggies but I also comsume a lot of onions, mushrooms, eggs and nuts. All of foods I LOVE! How did you feel with too much nuts? I have a feeling this is culprit of my bloating and stomach aches when I consume too much. I’ve been on the FOODMAP diet for just a couple of days now and I noticed less bloating (yay) but today noticed some constipation and gas. I had both nuts and eggs today. Any insight/similar symptoms? Thanks so much for your time. Hi! I don’t do well with nuts… I tried macadamia, almonds, walnuts… whole, roasted, soaked, nut flours and nut butters… I really wanted to be ok with them, but my body doesn’t agree! I have been feeling a lot better since I finally accepted that nuts are not for me! Give it a try and you should see a difference (if that is what is your problem) within a few days, especially if you eat them on a daily basis. Allow yourself at least a couple of weeks to have a better picture of how the low-FODMAP diet is helping you because your intestinal flora and guts need time to adjust. Keep me posted! I do consume nuts daily but will be testing out this theory and REALLY hope I don’t have to give up nuts/nut butters. But will of course if it makes me feel better. What about eggs? I know they are low FODMAP but read on other blogs they can cause gas and bloating. Thanks so much for your insight. Hi again! Eggs might bother some people, but it is very individual. The egg yolk, which is the most nutritious part, is usually better tolerated. Try not having eggs for a few days maybe and then reintroduce the egg yolks for a few days and if things don’t change (no bloating, etc), reintroduce whole eggs. Good luck! Im in a similar (digestive wise) situation right now.. Gosh I dont know what to eat most of the time. I went on GAPS and was fine in the beginning but yeah those nuts and honey were no good for me. I was at the point where I was eating chicken soup for at least a week. I got sick of being stuck in intro and decided to check out FODMAP foods. So far it’s working but can’t have the nuts or peanut butter. And certain raw veggies. But I ate a banana and an orange without troubles in the last few days! The first fruit I’ve had in weeks! Anyway FODMAP looks good but frustrated that they seem to not take stock that certain allowed foods are so unhealthy no one should eat them.